Hello friends! Welcome to the Tim Holtz - Creativation 2019 Blog Hop and give away. It's going to be a great hop full of amazing projects and inspiration! I hope you enjoy all the beautiful project from the talented artists. The Tim Holtz booths included Idea-ology, Ranger, Sizzix, Stampers Anonymous and Tonic Studios. 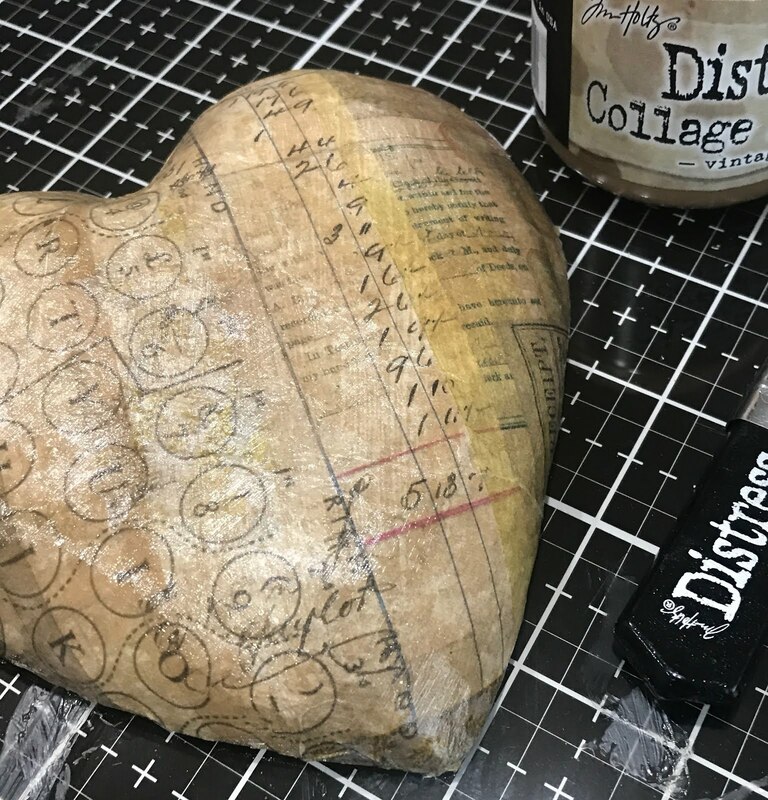 A special thanks to Tim Holtz for inspiring us, creating products we all love to use and being so innovative with new products. Thanks to Mario for all the BTS! and a big thank you to Paula for all her hard work and dedication. 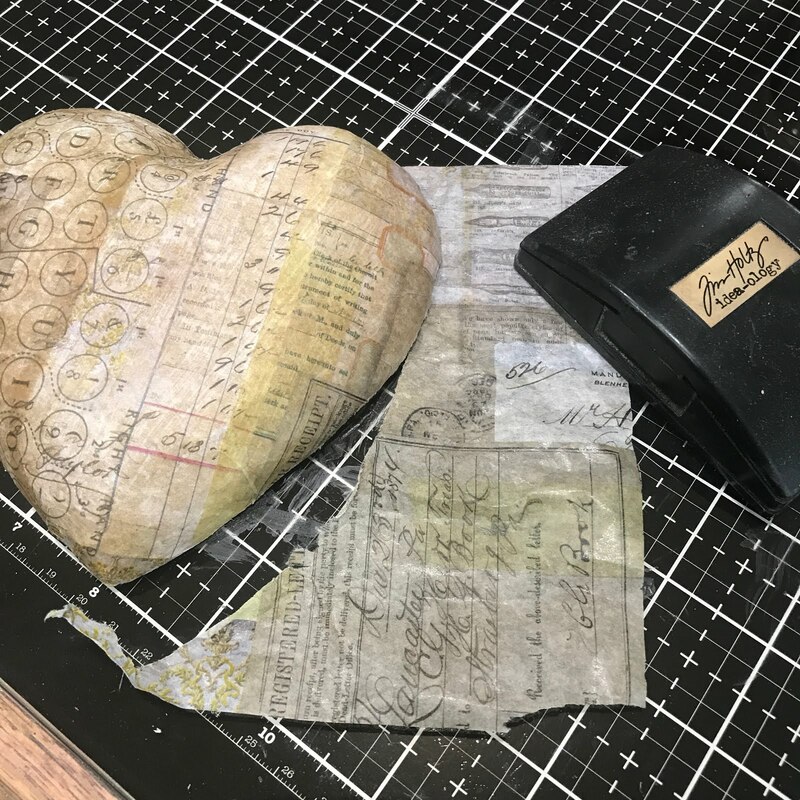 First I took a paper cache heart and cut it in half with scissors. Cover the outside of the heart with Collage Paper using Distress Collage Medium in Vintage. 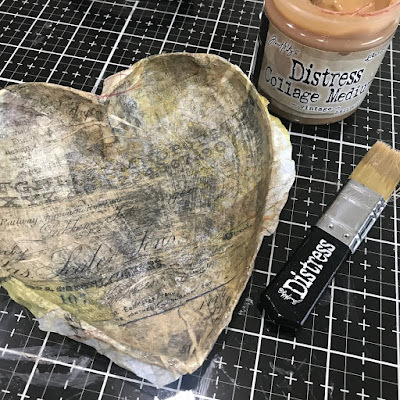 Brush the heart with the Collage Medium then carefully res the Collage Paper to the heart, continue working until it's completely covered and let dry or dry with a heat tool. Sand the edges to remove the excess Collage Paper. Apply a thin coat of Collage Medium over the top of the Collage Paper. Repeat the process and cover the inside of the heart. don't forget to apply a layer over the top to seal. If the inside of the heart is dark you may want to paint it a light color. Add Gadget Gears, Mini Gears, Sprocket Gears, Game Spiners, Keys, Story Stick, Pocket Watch. Hardware Heads etc... Use small wood blocks and/or foam tape to add gears at different levels. Stacy Hutchinson blog to see her gorgeous project! You are sure to be inspired! But before you leave please leave a comment below for a chance to win some prizes. Comments must be posted by midnight on February 9th and winners will be announced on the 10th. Thanks to everyone below for sharing their inspiration! Thank you all so much for stopping by the blog! Products for making this project available at Simon Says Stamp. i love the way you tranformed the paper mache heart and the gears take it to the next level! A fav for sure! All those mechanicals and gears in there...reminiscent of a real heart! LOVE every bit in there and I'm sure it must having taken you a while to layer it up. The pop of red is brilliant, but of course you are brilliant! Such an incredible piece - all those layered cogs and gears, the machinery of the heart, but almost my favourite thing about it is the fabulous look of the back - so cool! OH MY!!! Love this and now I know exactly what to create for my friends birthday coming up! She’s gonna LOVE it; it’s screaming her name! I’ll use her initial and it will be so perfect. Thanks for the inspiration! What a great steampunk and romantic project. Love the vintage colors and all the layers og endless gears and cogs. Amazing is right. Wow it is a true treasure. Thanks for the fun. So many fun elements. I would have never thought to cut up paper mache. That opens up worlds! The collage on it is my favorite. So simple but so beautiful. Thanks for sharing! Thank you for hosting this blog and for your beautiful work! OMG, wow, just amazing! I love the idea of cutting open the heart to create your gear collage. Just Wonderful! Just amazing! Your instructions make it sound so easy and I am quite sure it requires much thought and talent to arrange it all. BTW I enjoyed doing your deer vignette last year. Thanks for sharing your talent. Very well done! You've made it look like the inside of a working timepiece....an old and well-loved timepiece. TFS! 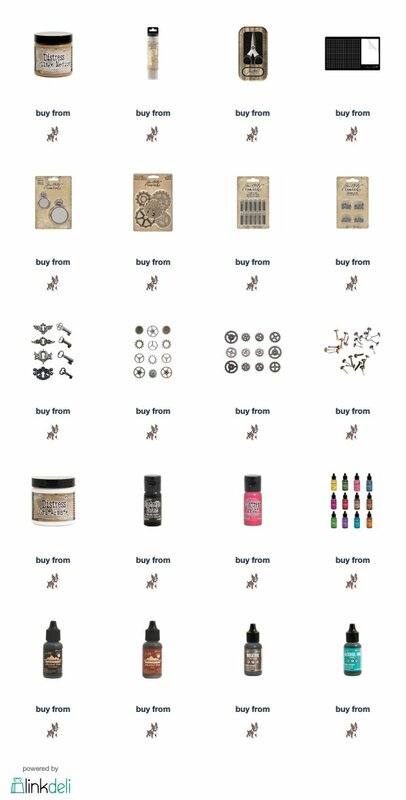 Tim Holtz Steampunk "delicious-fied " hahaha new word !! Girlfriend this is amazing ! <3 Thank you for an awesome creative hop experience !! I just finished up on all the blog posts. Thank YOU for hosting. All the projects were totally awesome. Great use of the products and so very much inspiration. Can't wait for the items to reach us for purchase. Love this fabulous piece! The heart looks so amazing cut in half and covered with the paper. And, the gears and cogs give it the steampunk look that I admire but am not too good at creating. Too much fun and creativity here! Wow, beautiful! I love the heart, and the gears, the whole piece!! What a great idea. Thank you for sharing and inspiring!! Love it Richele! Yes, you keep the gears turning in my heart! Extremely creative to say the least. Thank you for the tutorial and the thrill! 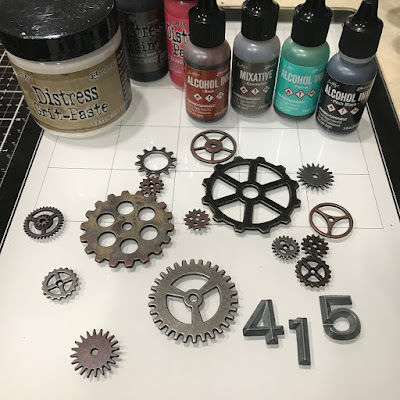 Love the use of the gears for your project. Thank you so much for the inspiration. Headed to the store right now for a paper heart. I have a stash of Tim's sprockets, etc, and can't wait to try my hand at this!!!! Amazing project ... thank you for sharing. I love this idea!! Great inspiration and fun for Valentine's day! Amazing conglomeration of bits and bobs. Love the spot of red! As always an amazing project. The heart is great for valentine's day and with red it just sets it off. Keep on inspiring us with your great ideas! Love the mix of feminine and masculine. Always love your amazing work! Such a great hop and inspiration! I loved them ALL! Thank you for the fun! What a fun and funky project, and just in time for Valentine's day! Love the layers of gears. 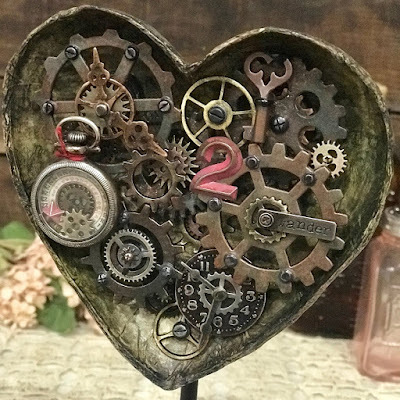 Oh my gosh, love this steampunk heart and all the gears. Richele - this is OUTSTANDING! 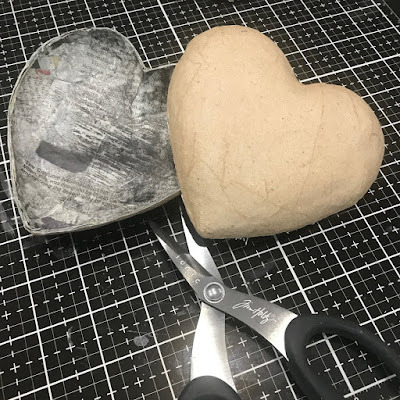 Can't believe that your creative mind thought to cut a paper mache heart in half and fill it with idea-ology goodness! This makes my Tim, grungy, idea-ology heart skip a beat! You go girl! I love this Richele! Great inspiration! Will someone let Tami Bastiaans know her site is coming up as viruses detected and would not allow me to view. Perhaps it is just my software but had no problem with the other sites - thanks! gotta love all those gears. thanks as always for sharing. Oh this has to be my favorite from Creativation! Absolutely inspiring! Such creativity and soooo much fun! Thanks so much for sharing and hosting this great blog hop! Just stunning! I love the heart and all the gears. So cool! Thanks for the inspiration!!! What a gorgeous heart piece! Love all the embellishments! This is a wonderful project. I love Steampunk style art. This steampunk heart looks so incredible Richele! I love the idea of cutting the mache piece in half and then adding the collage paper to create the housing for all those gears and gadgets. Really and truly fabulous. Thank you for sharing. Love everything about this. Thanks for taking the time to show the technique. You made it do-able. You knocked this out of the creative park Richele!! Love all the gadgets and gears, how you layered them is amazing!!! Beautiful! I love how you layered them. Thank you for sharing! I never thought to cut one of these in half and I know I have some! I will have to try this. I'm totally inspired. What a beautiful and creative project. Love it. This looks amazing. Brilliant idea. Thanks for sharing! Incredible project as usual! Thanks for the inspiration!! Richele, this project has stolen my heart, its grungy gorgeousness is magnificent! Thank you for the inspiration and for hosting the fabulous blog hop for all of us to see up close info on each project. I so appreciate each member in the "Team Tim", for the products, for inspiration, for enthusiasm for the crafting community! I love steampunk and I love this project. Thank you for sharing it. I always love seeing your beautiful work, and I always learn something new. Thank you! Love this steampunk "puzzle". Each piece is placed in just the right position. So fun! Love the vintage gears put into a gentle heart...perfect! So much detail in this heart! Love everything about it. Now how cool is this piece of art! So beautiful, and love the steampunk effect! Wow!!! 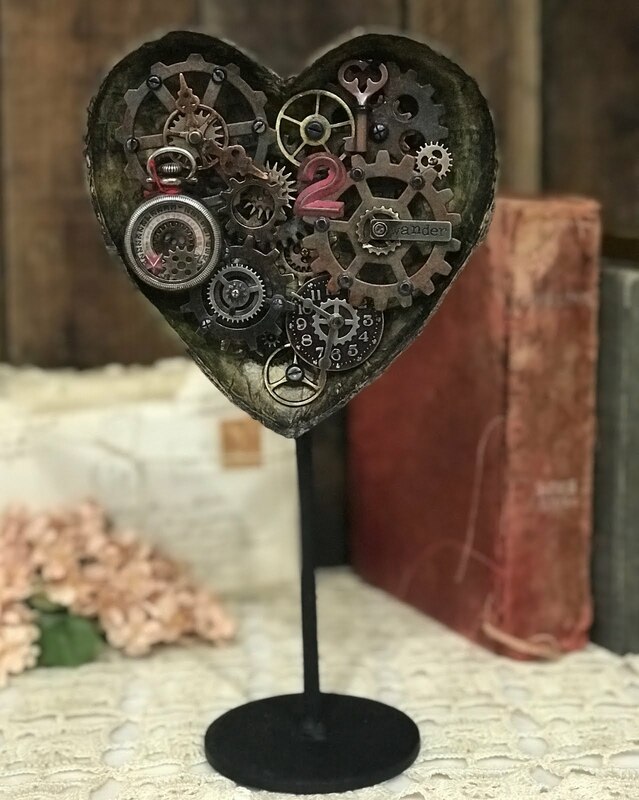 This steampunk heart is soooo cool!!! Just love the Steampunk feel of this darling heart. What a great thing to display too especially on Valentine's Day. Thank you for sharing. Just love it. I´m in awe over this piece! This looks gorgeous! So much inspiration given with this. Thank you so much Richele! This is amazing - the patience to put all of those gears in! Thanks for reminding me about the distress collage it make such a difference. The more I see of this collage paper, the more I know I need it! Love your steampunk dimensional heart. Your gear collage is exceptional! Thank you for the inspiration and for hosting this fun and super inspiring blog hop! Gorgeous home decor this makes, love it Thanks for sharing! 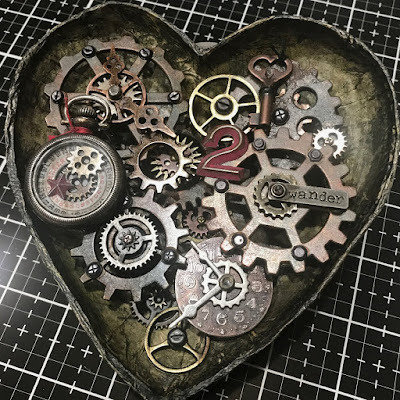 Beautiful grungy steam punky heart! TFS! This is a great steampunk project. Thanks! I have made it all the way through the hop...what wonderful inspiration from all the designers...my wish list is soooo long now...LOL. Oh wow! This is one of the most wonderful project that I've never seen!!! such an AMAZING project. All those supplies! This has my steampunk-loving heart racing!!! Fantastic!! This blog hop is a great idea. What a wonderful place to find inspiration! Another great idea for my gears, thank you. An amazing heart! Congratulations and thanks for the inspiration. The key to my heart - what a fabulous project! What great inspiration, thanks so much. This is super cool and funky! I loved seeing the Vintage collage medium in action. I've been curious about it and know I know! Oh, my gosh! I love steampunk and just finished reading the Girl and the Clockwork Cat. This is a very cool piece. Thanks for sharing. love this project! really speaks to my steampunk heart. I love the way you used the gears in your heart collage. 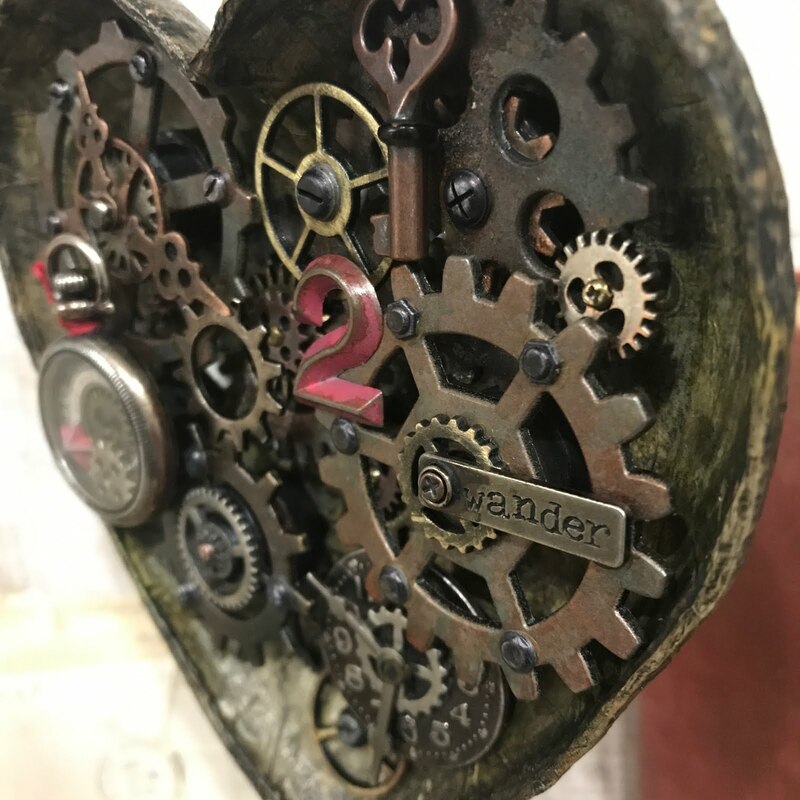 What a cool steampunk heart! Even the heart looks metallic. Steampunk, dimension and a heart... be still my heart. this is amazing. Great job Richele! 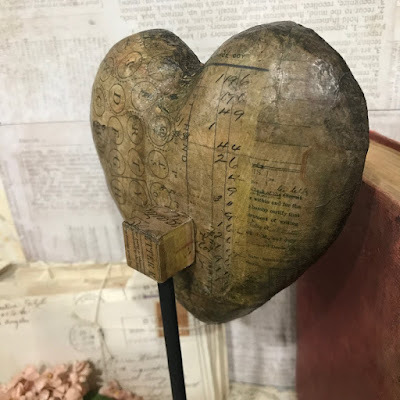 I love how you transformed a simple paper mache heart and turned it into a steampunk piece of art! Just in time for Valentine's too!! 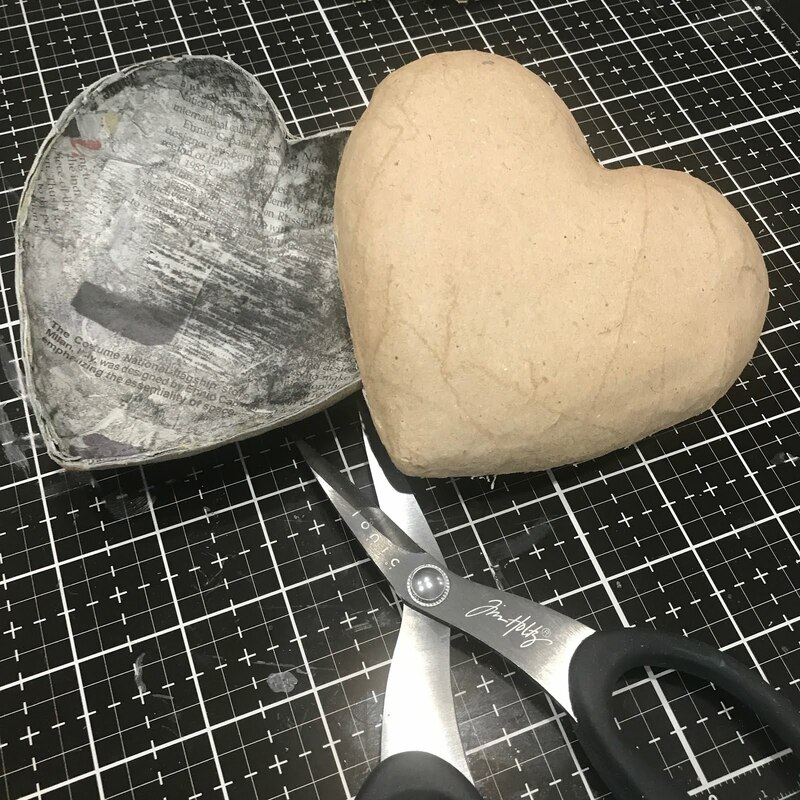 Such a creative design cutting the paper mache heart in half Richele! 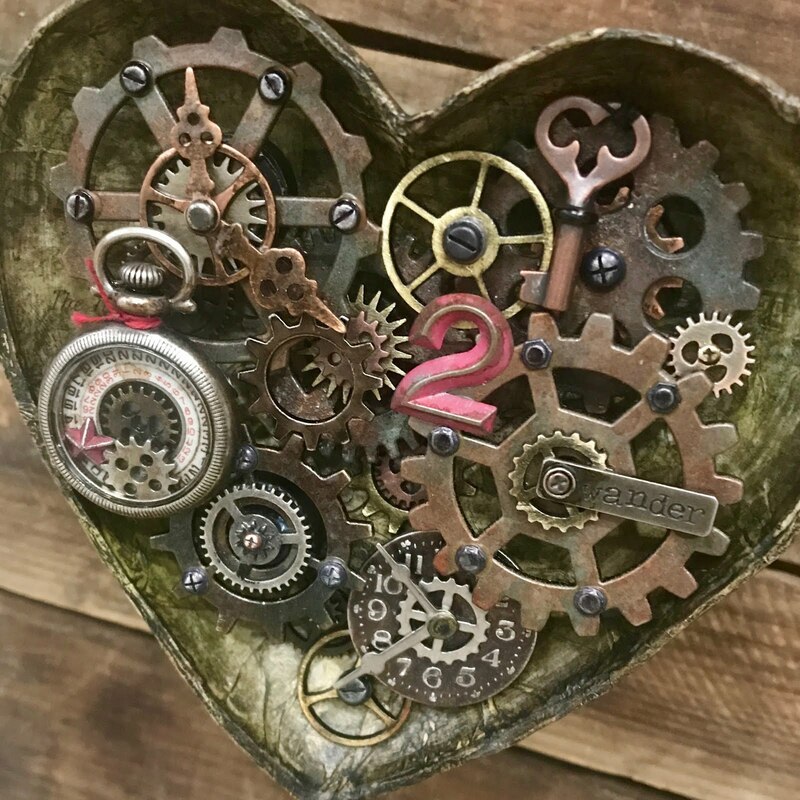 Love all the layering of gears - a beautiful steampunk Valentine! Wow! I love this heart! Great use of all the gears! Love it! Love this heart!! very steampunk!! Love this, Richele! And just in time for Valentine's Day. thank you for the tutorial...maybe I can raid my hubby's junk drawer to customize it to his hobbies plus all the TH mechanical parts. What a great idea! Love the colors and the pop of the red bits! Awesome project with so many details! What a great art project. Love all the details. This heart art is adorable and amazing! You always astonish me, Richele. Your projects are complex, intriguing and yet convey an intelligent "whole" concept that comes across as a delightful surprise. Very cool project. What a fab Steampunky assemblage! I swear it looks like it should tic, turn and spin! You built amazing detail into the heart. I'd love to hang it on my wall! Very clever piece Richele, love it! What a cool idea to make. Love all the gears and how you transformed the paper mache heart! Thanks for sharing. What a cool project! Love the gears and those metal elements... the heart base is so pretty! Love it! Okay, so I never thought of cuttting the heart (or other object) in half. Brilliant! And I loved the way you covered it. Love how you cut apart the heart and all those gears inside, great project! It’s official, the gears will be making an appearance out of my stash! ♥️🙌♥️🙌♥️ Your paper heart gear is truly inspirational Richele! Thanks you for sharing your creativity with us, certainly appreciated see your photos of the process. Deepens my love of gears and cogs more than ever!!! Layers, romance, grunge . . . so many awesome elements to this project. So enjoyed checking out how you created it! Thanks for sharing! Oh Richelle! How I love this Mechanical Heart! Beautiful job on this! Well done girlie! Another amazing project, and a big thank you for the blog hop, very much appreciated. I haven't done one in a long tome, I am really enjoying ready all of them. Kathud !! Me, falling over ! Just amazing & as always, thank you for sharing your process with us! I can't believe all the detail, it's simply stunning! I just love the industrial look of this. This is stunning Richele, a real steampunk heart! What a great idea to make with such awesome products! Thank you for the tutorial and sharing this piece of art. 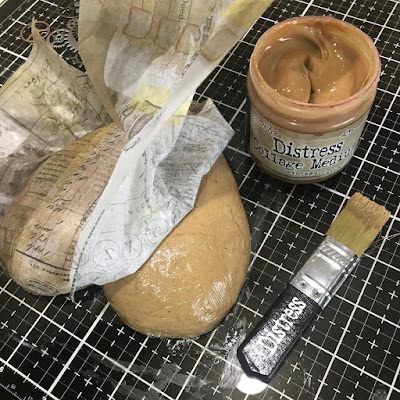 I had so much fun and got so inspired during the Creativation 2019 Tim Holtz Blog Hop, thank you also very much for organizing/hosting this great hop. Love this steampunk heart, Richele! I think I may need to create one! Thanks so much for hosting this blog hop, love seeing the tutorials and tips on everyone's projects. Stunning project which has given me many ideas. Such a neat project! I wouldn't have thought to cut a paper mache heart in half like you did, but now that I see it and how the colage paper looks on it, I think I'll be looking for all kinds of shapes to transform! It looks so cool how you nestled all the gears inside the heart and made a stand for it too! So clever. I love everything about this! You are SO crative! You stole my heart with a valentine project, and then it beat even faster whenever you made it into a steampunk heart. Love it! 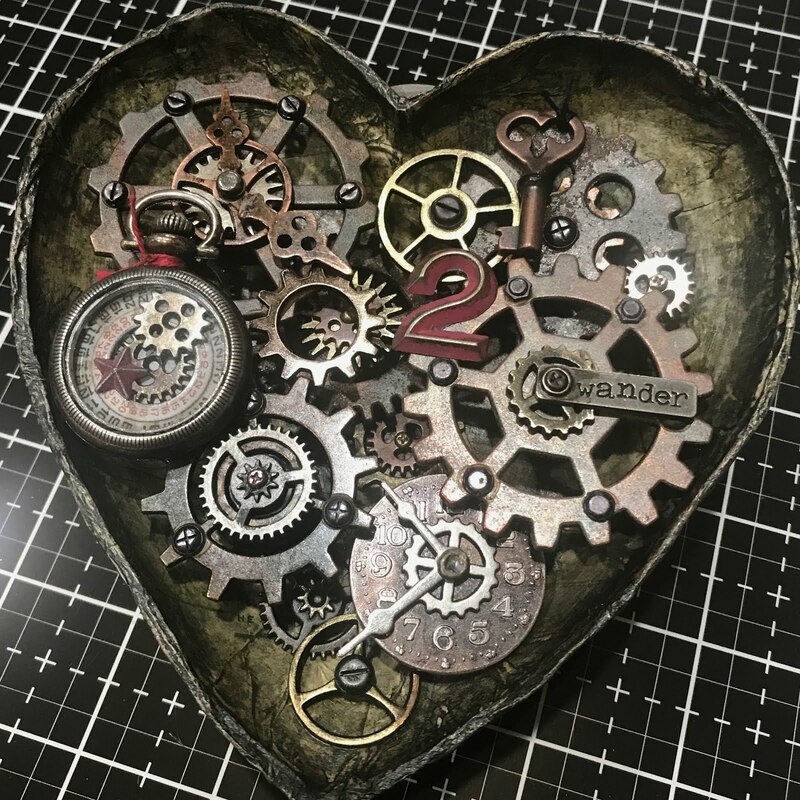 Steampunk awesomeness and a heart for Valentine's Day! Wow, amazing project! The layers of gears are so fun and industrial, it leaves me guessing what they run. A pocket watch a cool steampunk machine - just too cool. I love this piece! Amazing!! Love all the gadgets in it. All of those pieces come together in such an interesting way. Fantastic piece! I love the distress look of the heart. I always love anything with gears in it and mixed with the clock pieces and numbers is so interesting. Really like all the gears and clock pieces. My engineer son would like a version of this and I might try it and try to make some moving parts with a clock mechanism. TFS! What a wonderful use of gears and spare parts from the Idea-ology line. Thank you for taking the time to create this project and sharing it with us! What a fabulous piece! I love the gears- so inspiring. Thank you for sharing this project! Stunning! love all the details, I keep finding new ones! Thanks for sharing! I've done crafting & scrapbooking for many years but am fairly new to mixes media. Love all the info & ideas I'm finding in this Blog Hop! All those wonderful gears ... fabulous project and so creative. Wonderful project. Love all the gears and decoupage. Wow, great combination of the heart with the industrial. I love the that you made the gears at different levels it adds so much visual interest and using the paper instead of painting the surface. Your creativity never ceases to amaze me! Beautiful! It's so generous of you to share what you create. I have to wonder though, does the creativity just flow and become amazing on the first try or is it the result of many trials and a few errors?! Love your project. I have a stash of gears and cogs...thanks for the inspiration to dig them out and use them. Be still my beating heart... I absolutely adore this project in my ffavourite steampunk theme. Simply amazing and something I want to have a go at myself. Thank you for sharing. I love it! Love this heart. I had a hard time getting your site open. It was definitely worth the wait. Beautiful! Ohmygosh! I couldn’t love this fabulous heart MORE! I can’t get over it! I am most certainly going to give this make a try, myself, because I have a spot in my craft room that was MEANT to be filled with something this fun!!! Thank you for all your hard work! I love this heart so much! Now I need to find a paper mache heart to cut in half ;) And filling it with all Tim's Ideology yumminess is perfect. Thanks for sharing! Your heart is fabulous and love all the layers of the embellishments you used! And you can get projects from one heart, one to keep and one to give to me! Thanks for hosting the hop, it's been fun! What a great heart filled with gears. It is very steampunk and beautiful. My first thought was "Holy Cow!" I love your creations today.